The guys at October Toys did it again, after Gwins and Z.O.M.B.I.E.S. this is the last outstanding project from the uber-talented community there. 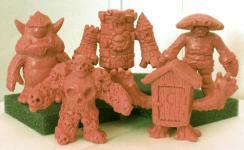 Remember the fun of collectible mini figures like M.U.S.C.L.E. and Monster In My Pocket? So do we! 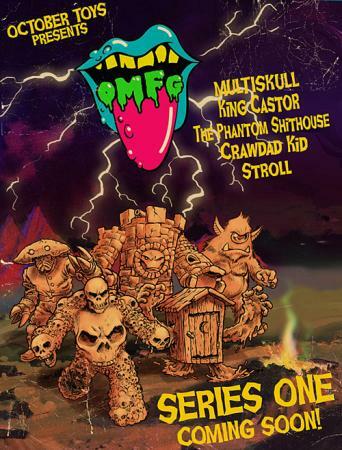 That's why we are proud to present to you the inaugural series of OMFG! - Outlandish Mini Figure Guys! As you can see from this list, it has truly been a community effort to bring these figures to life and now we would like to invite you to be part of that community! The prototypes are finished and we are ready to move forward with overseas production. With the help of Kickstarter contributors like yourself, we look forward to making this first series - of what we hope to be a continuing line of community created figures - a reality. Any funds above and beyond the goal will be dedicated to getting OMFG! Series 2 going. We also invite you to come join us in the forum and submit your characters for OMFG! Series 2! The goal has been reached after 5 days only! And if this isn't enough for you to love and run to fund this project here are some photos of the prototypes of OMFG! Series 1 as well as the gorgeous art for the logo and the package! I can't wait for these guys, they're awesomely designed and sculpted even better! If you have crazy ideas for some new characters be sure to join forums and check the topic for OMFG! Series 2 Design Submissions! TAGS » Exclusives, Indie, Minifigures, Monocolored, OMFG!